The fire that broke out beneath Hartsfield-Jackson Atlanta International Airport on Sunday burned its way through the facility's main power supply. Then it hit the redundant system, shutting down power at the nation's busiest airport for nearly 11 hours. All told, 735 flights were delayed and 1,593 were canceled over the course of two days. The resulting chaos highlights the aging infrastructure of American airports and how design issues can inconvenience the more than 2.5 million daily fliersin the United States. "I don't think anyone knows yet what the root cause of the outage was," said Robert Chicas, firm-wide director of aviation and transportation for global design, architecture, engineering and planning firm HOK. "Whatever it is that led to failure of that redundant system, we need to learn from that and be more thoughtful when we're designing new airports." For the most part, experts agreed that Hartsfield-Jackson was relatively successful in handling the massive power outage. 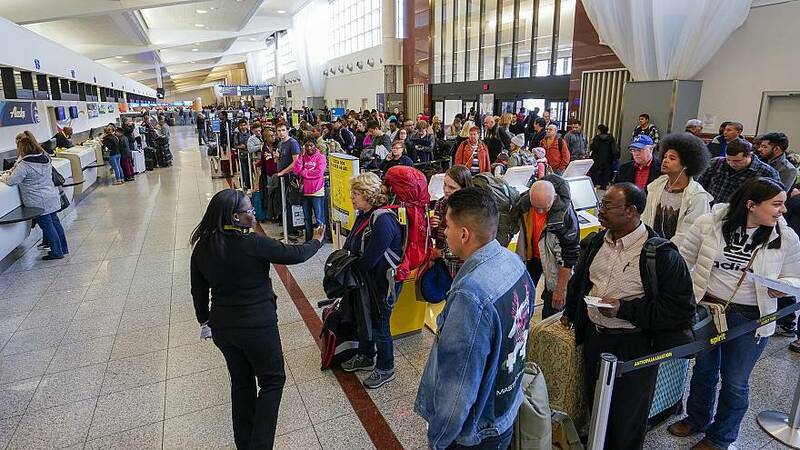 However, some experts say more airports could see serious failures, like the one experienced by Hartsfield-Jackson, if their infrastructure isn't modernized or updated. "The hub-and-spoke network has really been a wonderful thing for mobility of Americans," Rick Geddes, professor at the Department of Policy Analysis & Management and director of the Cornell Program in Infrastructure Policy, said, describing America's network of large and small airports. "The downside is we've had these services for decades and many, including air traffic control and the physical infrastructure, are old." Although the FAA has begun rolling out upgrades to GPS satellite-based navigation, which is used during approaches and departures, air traffic control spends the in-between time grappling with technology that is 40 years old. Host, the computer system that controls high-altitude traffic, was developed in the 1970s, according to WIRED. "I think it's amazing U.S. air traffic control system works as well it does," Geddes said, adding that the United States "has a long way to go in order to modernize its aging airports." Also when it comes to the future of airport design, Chicas said the horizon is still too short. "Lately, I've been citing Grand Central Terminal in New York. Grand Central celebrated its 100 anniversary [in 2013]. It's as relevant and valid today as the day it was built," Chicas said. "So whereas we're used to talking about airports and designing airports for next 30 to 50 years, I think we should be talking about 80 to 100 years." China and some Middle Eastern countries have been global leaders at building innovative, first-class airports, Chicas said. "Because they have the resources to build fabulous facilities, they are now rich in new 21st century airports," Chicas said of the other countries. "The U.S. on the other hand, we've done a really good job of modernizing and remaining competitive in the world aviation industry. Our challenge is we have older airports that, for primarily commercial reasons, can't be replaced in a wholesale manner." Airports are unable to fully shutter or be demolished and rebuilt because of the loss of both revenue and accessible travel. This means renovations can be painstakingly slow, Chicas said. "We're definitely making major strides in improving aviation infrastructure but forced to move at slower pace than other parts of the world," he said. Geddes said proposals in Congress have suggested moving toward a Canadian model, which would privatize the system to an independent non-government group. The last major airport to be built in the United States, Denver International Airport, was completed in 1996. But even though it is the newest airport in the country, earlier this year, the Denver City Council approved a $1.8 billion redesign of the Jeppesen Terminal. The deal is part of a public-private partnership (also known as a P3) intended to give the airport a facelift. P3s are typically partnerships between a private company or companies and a public entity. The private company designs, builds and finances a project while ownership remains with the public entity. Geddes feels P3s are the future of modernizing America's airports. He said that P3s open significant capital to flow into airport infrastructure, and allow the government to stipulate renovations and updates to the facilities. Maintaining and improving redundant wire systems that power airports can be a part of those partnerships, Geddes said. "To the extent that U.S. airports are getting old, you're going to see more of these failures of aging systems and one of the things P3s can do is require a lot of capital be put into the airports," he said. "Not just the shops but the things that are underground including wiring and the plumbing."